FIERCE exercises our power through campaigns that win meaningful victories for our communities. We organize against police harassment and the criminalization of LGBTQ youth of color. We also organize against gentrification efforts that displace LGBTQ youth of color and further cut access to safe spaces and services. FIERCE grounds our work within a long-term vision of changing the structures and root causes that give rise to the challenging conditions our communities face. We are committed to find solutions that are based in solidarity and do not put other communities at risk. 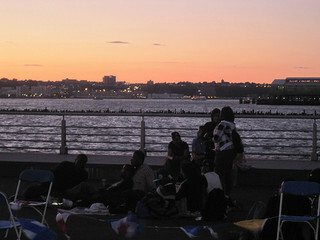 Summer Movie Screening on The Pier, NYC. FIERCE developed the Save Our Space Organizing Platform to counter the displacement and criminalization of LGBTQ youth of color and homeless youth at the Christopher Street Pier and in Manhattan's West Village. The Pier, located on the fringe of the West Village, has historically been the only safe public space for many homeless and low-income LGBTQ youth of color to build community. As part of this platform, FIERCE is currently organizing our Safe Space Saves Lives Campaign, conducting Know Your Rights outreach, organizing Copwatch teams in the West Village and fighting discriminatory policing as part of Communities United for Police Reform! In the summer of 2000, FIERCE members began organizing against increased policing and mass arrests of youth of color on the Pier and on Christopher Street. When the state and city government closed the Pier for reconstruction in 2001, many West Village merchants, residents and political leaders expressed their hope that the redeveloped Pier and beefed-up police presence would improve their quality of life. FIERCE's concept of quality of life not only ignores, but adversely affects the quality of life of LGBTQ youth, especially those who are of color. To this day, LGBTQ youth who go to the pier have reported sharp increases in police harassment, false arrest and racial and gender profiling - usually for just being in the neighborhood. At FIERCE we continue to focus our campaigns on the oppressive "Quality of Life Policies” and bias, often violent, policing of our communities. The laws gave police the authority to treat petty offenses such as panhandling, public urination, blocking a sidewalk, loitering with the intent to prostitute, graffiti, and homelessness itself as worthy prosecution. This emphasis on policing drew massive resources from other social services and education that have the potential to actually address poverty and safety. In fact, under Guiliani and continuing through the years of the Bloomberg administration, the only "public service" that increased funding was "criminal justice. 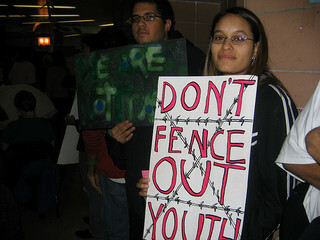 Through a mix of youth-led organizing and activist strategies - including direct action, media advocacy, street visibility through art/activism, and testifying at public forums - FIERCE has been able to change the terms of the public debate about quality of life and public safety in the West Village so that the voices of merchants and residents, politicians and police, are not the only ones that are heard.